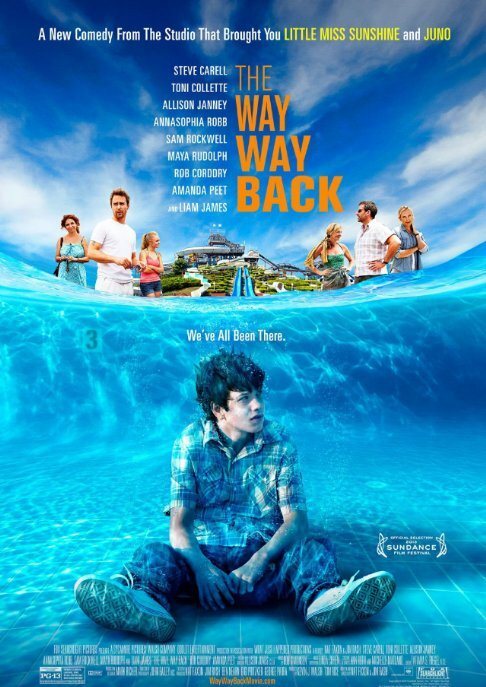 One of the most successful films showcased in the 2013 Sundance Film Festival, The Way Way Back is a beautiful coming-of-age story about a shy preadolescent named Duncan (Liam James) who finds a confidante in a water park manager named Owen (Sam Rockwell). Duncan is a lonely kid spending summer vacation at the beach with his mother (Toni Collette), her boyfriend (Steve Carell), and his daughter. He is miserable because he knows no one at the beach, save for his mother who is too busy drinking and partying with the neighbors to spend time with him. Her boyfriend Trent is also very rude and condescending towards Duncan. Eager to escape, Duncan goes on a bike ride and comes across a water park where he meets Owen, a childish but friendly man who exudes self-confidence. Sensing that Duncan feels lost, Owen takes him under his wing and introduces him to a variety of supporting characters (including Jim Rash and Nat Faxon, who wrote and directed the film). It is here at this water park that Duncan manages to come out of his shell and find a place where he truly belongs. I really enjoyed this movie. Every character felt like a real person to me, from the over-the-top drunken neighbor (played by Allison Janney) and her wayward children to an exasperated co-worker of Owen’s (played by Maya Rudolph). Duncan’s mother particularly struck a chord with me. I disliked her character for her weak nature and failure to see her how unhappy her son was, but part of me understood why she was with Trent. She’s a single mom, alone in the world. She’s not blind to her boyfriend’s infidelity and controlling nature, but who else does she have to turn to? Like Duncan, her self-esteem is wrapped up in the people around her. The Way Way Back is a story of her growth and redemption as much as it is Duncan’s. It took me a while to warm up to Duncan, whose personality first came off as so aloof and awkward that I couldn’t stand to watch him. Mid-way through the film, however, I realized that Duncan is just lacking a positive male role model in his life. When he has that, Duncan comes to life. Sam Rockwell, to me, is the real star of this film. I was drawn to him from the beginning, as Duncan was. He’s sarcastic and lazy, but also a genuinely warm and loving guy. There are comedic moments where he wise-cracks and rambles endlessly to help Duncan lighten up and feel at ease, and other serious situations where he’s quiet and supportive to give Duncan the opportunity to vent. He represents everything this boy could be when he grows up, and while their friendship is short-lived, it’s one I’m sure Duncan will remember for a lifetime. Check out The Way Way Back yourself, available at the Gabriele Library. Sandra Bullock’s rise to fame is most attributed to her role in the 1994 action film Speed, but I will always credit her starring in the romantic comedy While You Were Sleeping as the moment when this talented actress became America’s sweetheart. Bullock plays a lonely token collector at a Chicago train station named Lucy who is enamored by a handsome stranger who commutes every day by train. One day, this stranger (named Peter) falls onto the tracks and Lucy rescues him. Peter ends up in a coma and through a misinterpretation at the hospital, one of the nurses informs Peter’s family that Lucy is his fiancée! Without a family of her own to go home to, Lucy is touched by the love and affection Peter’s family bestows upon her and decides to play along with the lie. But what will she do when Peter finally wakes up, especially since she is starting to fall in love with his brother Jack?! While You Were Sleeping is a perfect balance of comedy, sentiment, and romance. Lucy is quirky and down-to-earth and the supporting characters, including Peter Boyle and Micole Mercurio as the parents, are hilarious. I especially liked Bill Pullman’s portrayal of the brother Jack. While You Were Sleeping is a feel-good movie that I can watch year-round and one that I highly recommend you check out this summer! What would you do if you found out you only had a few weeks to live? This is the question that confronts Georgia Byrd (Queen Latifah), a timid woman who works in a retail store in New Orleans, cooks fabulous meals that she never eats, and daydreams about the life she wished she had. When she is told by a physician that she has a rare disorder called Lampington’s Disease and her insurance will not cover the operation that can cure her, Georgia quickly goes through the stages of grief before deciding that enough is enough. She quits her job, gathers whatever money she has, and spends it all on a luxurious spa vacation in Central Europe. Throwing caution to the wind and indulging in every fantasy, Georgia manages to impress several hotel guests and staff with her carefree spirit while making enemies of some others. Ultimately, Georgia realizes that what she really wants to do before she dies is admit to a co-worker (LL Cool J) that she loves him. But will she reach him in time? 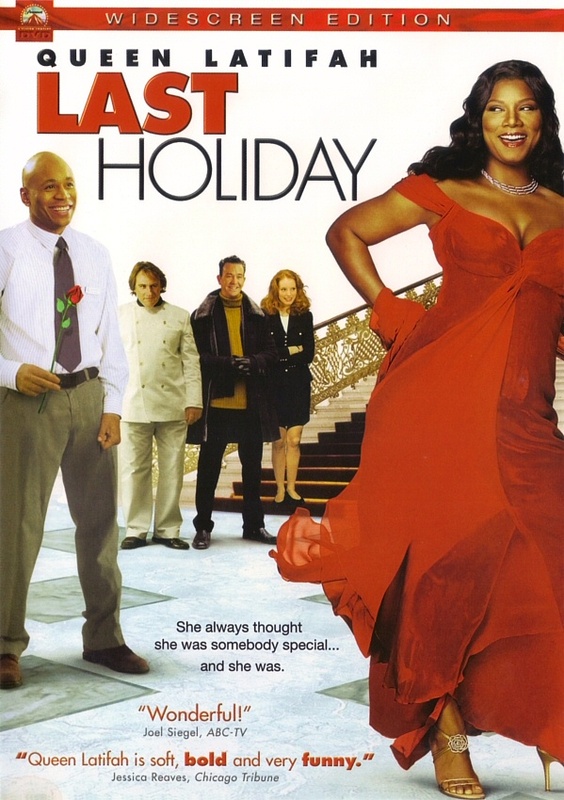 Based on a 1950’s British film, Last Holiday is predictable yet enjoyable. The scenery is breathtaking and Queen Latifah is wonderful as the leading lady. I especially liked the juxtaposition of Georgia’s timid former self with her self-assured transformation. Funny and charming, Last Holiday is a feel-good movie that will inspire anyone to live each day as if it were their last.